Some points of clarification for our readers: First, as written in this blog in the past, regular holidays and special non-working holidays are governed by different pay rules as mandated by the Department of Labor and Employment. Even if an employee chooses to not report for work on Maundy Thursday, he or she will still get 100% of his or her salary for that day. This applies regardless of a worker’s employment status. Meanwhile, employers are not required to pay their employees during special non-working days (ergo, the policy “no work, no pay”) “unless there is a favorable company policy, practice, or collective bargaining agreement (CBA) granting payment on a special day.” Read the detailed DOLE pay rules here. Because of the three consecutive holidays, some employees may be tempted to prolong their vacation. According to DOLE, workers are entitled to holiday pay only when they are “on leave of absence with pay on the workday immediately preceding the regular holiday.” Click here to read DOLE’s Handbook on Worker’s Statutory Monetary Benefits (2010 edition). What about Easter Sunday, which falls on March 31, 2013? Curiously, it is listed neither as a regular holiday nor as a special non-working day. Ergo, if the nature of your job requires you to work on this day, chances are, there’s no premium pay for you. “Sa daang matuwid, marami ang gustong sumali. Pero meron ding nagpapanggap lamang,” Aquino warned in the advertisement. This is in direct reference to politicians previously allied with President Gloria Macapagal-Arroyo who are now in his camp. Aquino then introduced his bets as individuals the public can truly trust (“Ang siguradong mapagkakatiwalaan…”). After introducing all twelve candidates in alphabetical order, Aquino declared: “Mga tunay na tuwid sa daang matuwid!” A male narrator then quips “Daang matuwid, mag-ingat sa ‘di tunay” just before the ad ends. The president’s “daang matuwid” slogan was first used during the 2010 presidential elections (watch the video here). This message resonated effectively for an electorate tired of the corruption scandals that hounded the Arroyo administration for nine years. It also explains why three years into office, Aquino is still very adamant in drawing contrast between him and his predecessor (for example, he hit Arroyo yet again during the LP’s proclamation rally last February 12). 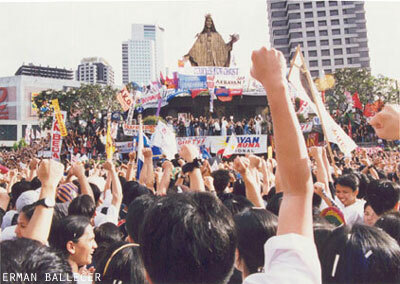 And although Aquino’s continued attacks on Arroyo makes him sound like a broken record, he remains popular. According to a January 19 to 30, 2013 survey by polling firm Pulse Asia, Aquino retains a 66% trust rating among Filipinos. This is twelve points lower than his November 2012 rating, this approval rating is still something that most head of government can only dream of. United States President Barack Obama for instance has an approval rating of 52% although he is only less than a month into his second term. The campaign ad of Team PNoy is interesting in many angles. 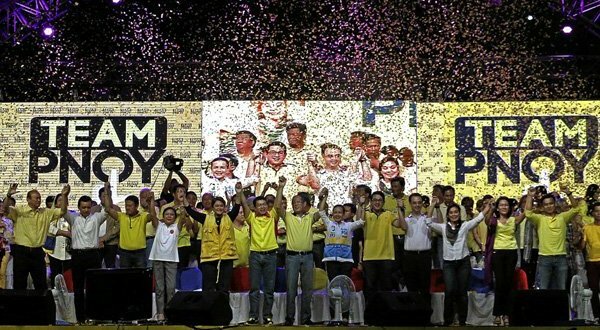 Noticeable is the decision of Nacionalista Party candidates Alan Peter Cayetano, Antonio Trillanes IV, and Cynthia Villar to not wear yellow in the advertisement. Speaking to Rappler.com, Cayetano explained that this is their way of retaining their identity even though they are coalition partners with the LP. “Out of respect, instead of wearing our own color (orange), we’ll wear our neutral color,” Cayetano said. A similar observation has been made about Mar Roxas, Aquino’s 2010 vice presidential candidate. Instead of wearing yellow, Roxas sought to make himself standout by wearing blue in public appearances. In a report by Vera Files, political strategist Malou Tiquia commented that in doing so, Roxas “was more of Mr. Palengke than a partner of Noy (Aquino).” In contrast, Roxas’ opponent Jejomar Binay seemed more than willing to associate himself with the Aquinos as evidenced by this ad for him by Senator Francis Escudero. Aquino’s main message that some politicians are merely riding on his administration’s anti-corruption drive may be true because of the bandwagon mentality. However, it makes him sound like a demagogue and a hypocrite. 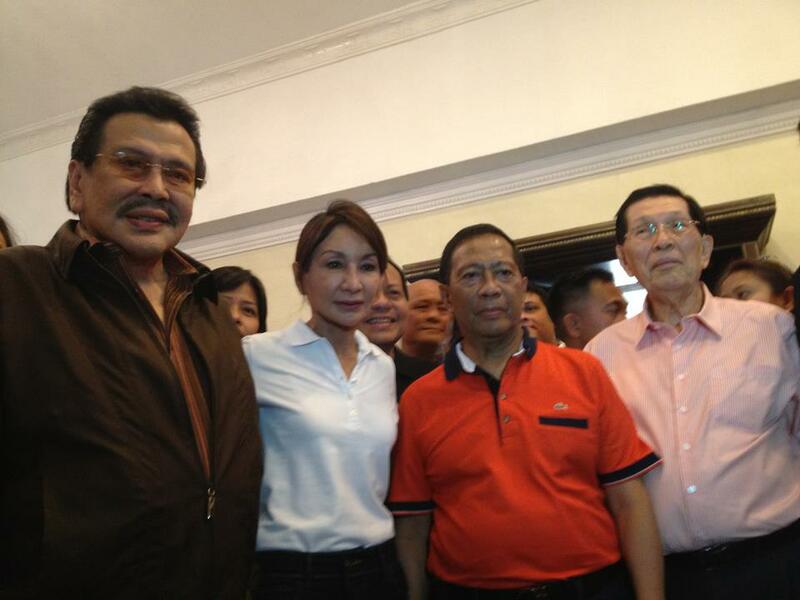 Not all of his party mates are stain-free, and this includes his allies in Palawan who are involved in the Malampaya fund mess and his shooting buddy former Interior undersecretary Rico E. Puno. Aquino himself is not immune to the realities of politics of convenience. How does he explain his endorsement of Mrs. Villar, the wife of the man he himself has accused of corruption just three years ago? President Benigno Aquino III has declared February 26, Tuesday, a special non-working holiday in Zamboanga City. The said city in Western Mindanao will be marking its 76th Charter Day anniversary (referred to locally as Dia de Zamboanga) on that day. Aquino made the announcement through Proclamation 544. Read the proclamation in full in this link. Zamboanga City became a chartered city in 1937, when the Philippines was still ruled by a Commonwealth Government under then-President Manuel L. Quezon. On February 26 of that year, Asia’s Latin City had its first set of city officials. Click here to know how you should be paid by your employer if you report for work on February 26. 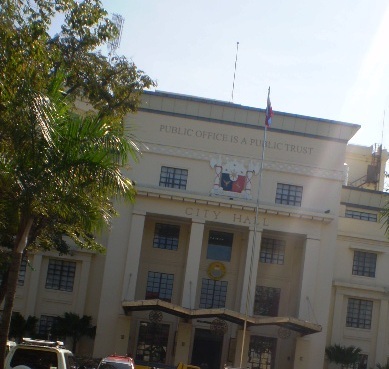 Cebu City will be marking its 76th annual charter day this February 24. The day, which falls on a Sunday, is a special nonworking holiday in the so-called Queen City of the South by virtue of Republic Act 7257. RA 7257 was enacted during the time of then-President Corazon Aquino. Read the full text of RA 7257 here. According to a brief history posted in the website of the Cebu City government, then-Interior Secretary Elpidio Quirino represented President Manuel L. Quezon during the event. 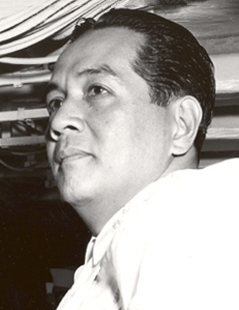 Quirino himself became president from 1948 to 1953.